Some of the participants are Canadian Forces Snowbirds and the U.S. Navy Blue Angels. Events included for this year will be demos of the CF-18 Hornet, A-10 Thunderbolt II, Skyhawks parachute team and more. Farnborough Air Show - July 21 and 22, 2018. - 5 hours of flying demos. Girls in Aviation Day - October 13, 2018. Northern Spirit Chapter, Winnipeg, Manitoba. Alberta Rocky Mountain High Chapter, Calgary, Alberta. Sea to Sky Chapter, Vancouver, British Columbia. Western Aviatrix Chapter, London, Ontario. Winged Warriors (Univ of Waterloo), Waterloo, Ontario. Check the web site, wai.org, for other chapters world-wide. 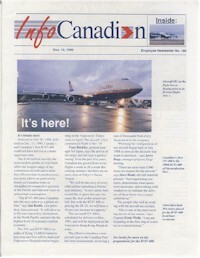 Air Canada employees and retirees may have noticed that "The Daily" has been revamped to more of a 'newsletter' format. Check out the ACaeronet site if you have not seen the new format. Air Canada has firm orders for thirty-seven B-787's, including eight -8's and twenty-nine -9's. As of March 31, the airline is operating 33 of them, and planned to take delivery of the last two by the end of 2019. It operates all the -8's ordered and is taking the remainder of its -9's. Captain Steve Davis and his wife Mina have sent us some photos. Mina sends this of her grandson, Tyler Davis, currently a Captain on the Embraer 190. 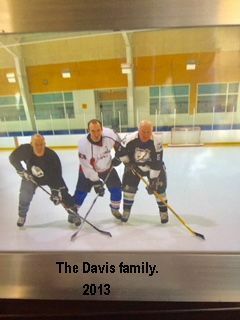 Steve sent us this photo that was taken in 2017, Kirk Davis, on the left, currently flying the Boeing 787, and yours truly, Steve Davis, on the right. When not flying, we often played hockey. The picture on the left was taken in 2013. Hired by Trans-Canada Air Lines on November 17, 1952——retired March 30, 1993. Promoted on the North Star, age 25 years. 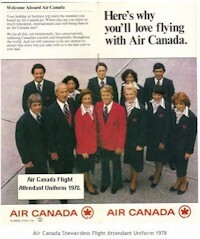 Here we have this Air Canada advertisement featuring the In Flight Service uniforms 1978. 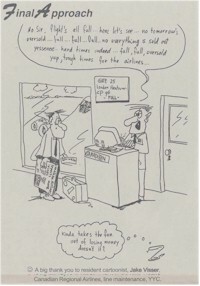 This is the Air Canada Intercontinental brochure issued mid 1980's. Below are colourful ticket wallets from previous years. 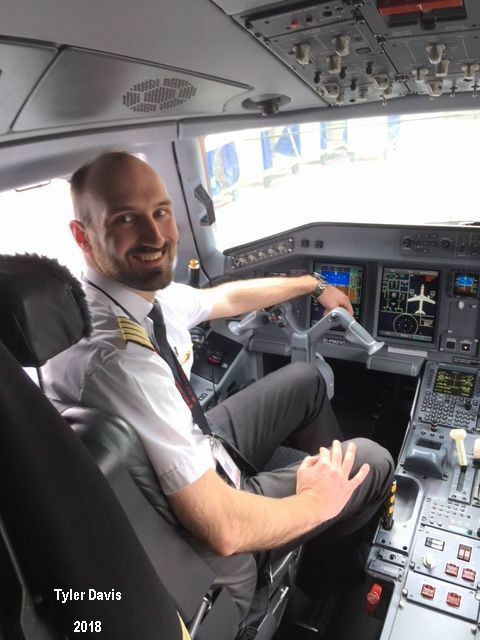 The Air Canada Pilots Association (ACPA) represents more than 3,700 commercial pilots who fly millions of passengers across Canada and around the world on Air Canada and Air Canada Rouge. 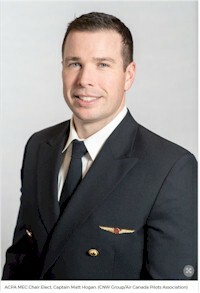 Captain Matt Hogan was elected Chair at a Special Meeting of its Master Elected Council (MEC) in Toronto. The one-year term will run from March 1, 2018 until March 31, 2019. For more information, visit www.acpa.ca. Extracted from "Horizons" magazine issued May 1983. The DC-8 aircraft has been retired from commercial passenger service. The last scheduled flight was CF-TIM fin #869 c/n 46035 as flight AC140 April 23, 1983 leaving Calgary at 17:40 arriving in Toronto at 23:10. On April 28, 1983 the aircraft was stored at Marana, Arizona until sold to ATASCO Leasing Inc December 29, 1984. 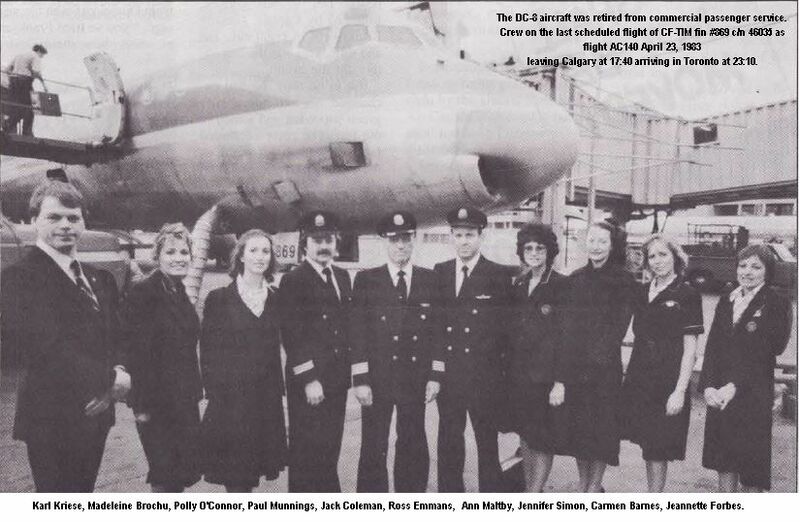 Flight Attendants Karl Kriese, Madeleine Brochu and Polly O'Connor; Second Officer Paul Munnings; Captain Jack Coleman; First Officer Ross Emmans; Flight Attendants Ann Maltby, Jennifer Simon, Carmen Barnes and Jeannette Forbes, In-Charge. The last charter flight ended at 10 minutes past midnight on April 24, 1983 when flight AC071 arrived at Halifax from Tampa. The retirement of its passenger DC-8's is a historic event marking the end of an era which spanned 23 years since the airline took delivery of its first model (series 40, 133 passengers, later known as "DC-8 short") CF-TJD fin #804 c/n 45445 on February 7, 1960. The aircraft went into service on April 1, 1960, on the Montreal-Toronto-Vancouver route. Trans-Canada Air Lines had entered the jet age. The aircraft, CF-TJD, was sold in 1, July 1977 to Templewood Aviation Sales Ltd, for lease to Air Celon registered as 4R-ACT. It had chalked up 21,401 landings and flown 46,166 hours. CF-TJL fin #812 c/n 45640 had the highest operational data having flown 55,859 hours and landed 24,354 times when is was sold December 19, 1984 to Lift Air Foundation of Liechtenstein. 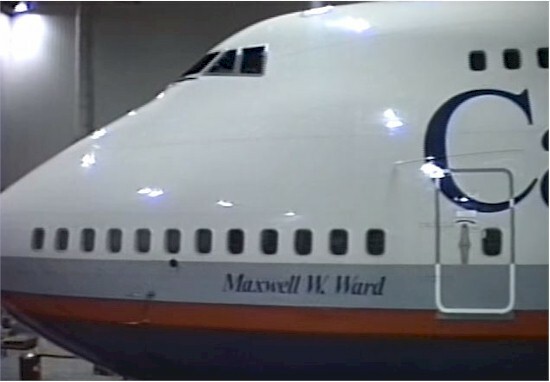 The aircraft had several operators and was stored at Miami where it was damaged during a hurricane in August 1996. Parting the early morning mist at Shannon Airport on St. Patrick's Day was the first all-cargo flight AC596 from Toronto and Montreal. 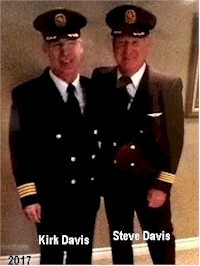 To mark the occasion, Airport Manager Aidan Larkin presented sprays of shamrock to crew members. 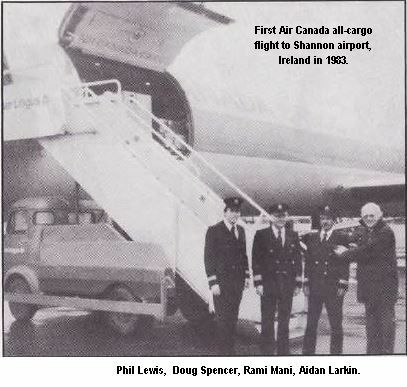 From the left: First Officer Phil Lewis, Captain Doug Spencer and Second Officer Rami Mani. The pilots were also installed as honorary Irishman for Ireland's national day. This brief ceremony required the use of the Irish version of their names and they became F/O Paddy O'Lucy, Captain Dermont Shaun MacSpenser and S/O Roddy O'Mahoney. Aidan apologizes for the poor quality of the photograph, but the dawn was overcast, the camera ancient and the film coloured. Although no longer used by Air Canada, the hangar is now the home of the Royal Aviation Museum of Western Canada. The aircraft shown is Lockheed 14H-2 Super Electra CF-TCM fin #35 delivered September 19, 1938 modified to 14O-8 on December 18, 1942. Sold to Montreal Air Services on April 21, 1947 after 19,019 hours flying time. I found this interesting video on YouTube showing various attempts (some successful) to get a "flying machine" in the air. See video below at 8:31 - More on the 'Self-Flyer'. Found in some fairly modern articles (Whittier Daily News web article dated 1/13/13) & contemporaneous (Popular Aviation, October 1933, p. 234). The Whittier article says Dr. C.H. Vance of Pomona invented the autopilot device, and pilot Paul Munro flew the plane. The newsreel film was taken Nov. 3, 1932. On Nov. 12-13, 1932, Munro spent 37 consecutive hours piloting the Curtiss Robin, and was refueled in the air. He was the first pilot to fly solo and have his plane fueled in mid-air, (he had to leave the pilot seat to guide the fueling hose). He came down missing the solo-pilot endurance record by one hour, when the refueling plane couldn't find his plane. The Sperry gyroscopic autopilot (which became standard equipment on most if not all large planes) was commercially introduced in 1932 but not fully perfected until some years later, so it's not such a surprise that this 'Self-Flyer' was a sensation in 1932. I wonder if the pilot is actually Douglas 'Wrong-Way' Corrigan flying under a pseudonym. Corrigan had helped build Lindbergh's Spirit of St. Louis at Ryan Aircraft Co. nearby, and wanted to copy the feat. He was an aircraft mechanic in the area for some years, and was an expert stunt pilot while keeping his flying secret from his employers. In 1938, he famously flew a Curtiss Robin to Ireland while claiming (probably to thwart prosecution) he'd intended to fly westward from Long Island. On the other hand, he may not have even been in Southenr California in 1932. 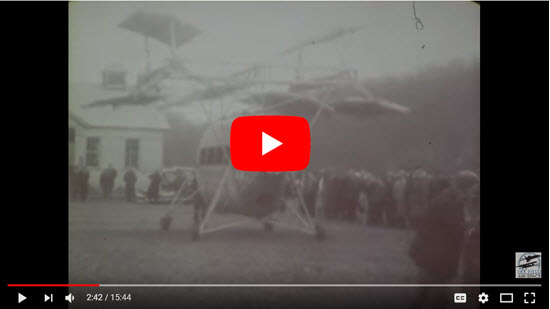 Sources say he operated a small passenger service on the east coast starting 1930, bought his Robin with an OX-5 (WWI-era V-8, considered antique in 1933, different engine than in the clip) on the east coast in 1935, and nursed it back to San Diego then. I tried comparing the clips of Munro here with photos of Corrigan. The pictures are a little fuzzy, so hard to say one way or the other. Frontier tales from Pacific Western. 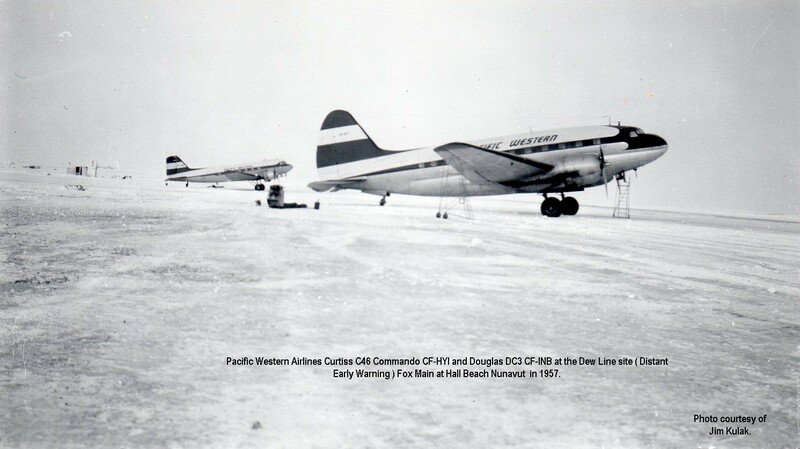 Pacific Western Airlines Curtiss C46 Commando CF-HYI and Douglas DC-3 CF-INB at the Dew Line site (Distant Early Warning) Fox Main at Hall Beach Nunavut N44’ 39” Latitude W63’36” Longitude in 1957. Hall Beach YUX was one of 42 radar stations constructed in the mid 1950s that stretched across the arctic from Alaska to Labrador, designed to monitor potential air traffic over the polar regions of North America. 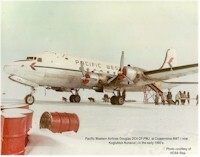 Pacific Western operated seven Douglas DC-3’s and seven Curtiss C-46 Commandos during the 1950's and 1960's, with many of these aircraft used to transport vast amounts of air cargo to the sites during the construction of the Dew Line, and later during the resupply phase. Both aircraft types were considered workhorses in their day. Photo courtesy of Jim Kulak. 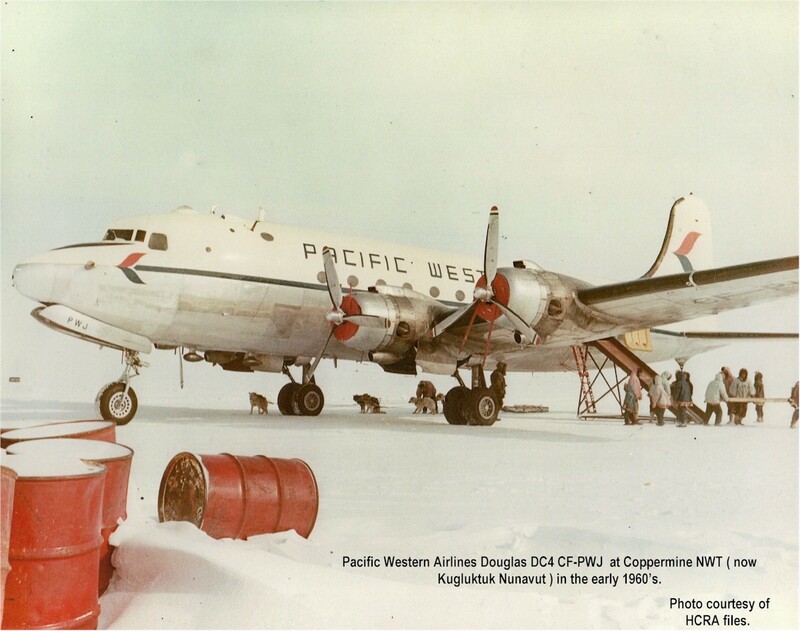 Pacific Western Airlines Douglas DC4 CF-PWJ offloading drum fuel and lumber at Coppermine NWT (now Kugluktuk Nunavut) N67’49” Latitude W115’08’ Longitude in the early 1960’s, with the assistance of local Inuvialuit residents and their dog teams. PWA aircraft provided a resupply lifeline to communities like YCO up on the arctic coast and their arrival was always a cause for excitement in the remote isolated northern communities. Photo courtesy of HCRA files, from the "Canadian Pacific COMPASS" magazine issue 1981. At the same time civil aviation was becoming increasingly important. In 1942, 10 small regional air services, flying North-South routes, were consolidated to form Canadian Pacific Air Lines. Two strong men, C.H. 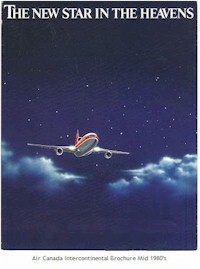 'Punch' Dickins and Grant McConachie took on the task of shaping the destiny of the new airline. D.C. Coleman, now president of Canadian Pacific, expected great things of company air transport after the war. The government, however, had different ideas. It ordered that, within a year after the war, railways would have to be out of the airline business. I love diving into any kind of history and, happily, we live at time when recorded history is readily available via video streaming services like YouTube. It amazes me that, after seeing the film “Darkest Hour” depicting the events leading up to Winston Churchill’s ‘Never Surrender” speech, I was able to sit at my desk and listen to the actual speech. It follows that YouTube is one of the sources that I use frequently to gather material for this space. While casually poking around YouTube one evening, I came across a great video taken by Paul Simpson inside the YVR Maintenance Hangar of the arrival of Canadian Airlines first B747-400 (C-GMWW Tail #881) in December 1990. Although I am an original Air Canada employee and did not work in the YVR Ops Centre until late 2001, the video still brings back fond memories for me. Unfortunately, I have never met Paul Simpson, nor do I recognize any of the people in the video. I did spend that last fifteen years of my career in this building and finished as an expediter working in the offices in front of the aircraft. If this video stirs nostalgia for me; I’m sure that it must be very touching for the people who were there at the time. It would be great to hear from Mr. Simpson or any of the others who appear in his video. Click the cover at left story on the delivery from Info-Canadian Newsletter #180 - December 13, 1990. Click the image below for Paul Simpson's video. Note: The video begins with footage of Fin 635 a B767-300. Fin 881 enters the hangar at 3:35. 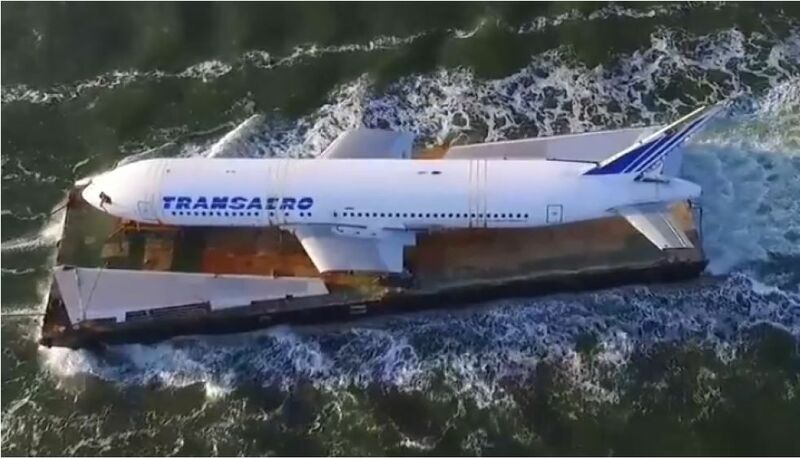 A decommissioned Russian Boeing 767 makes its way up the up Shannon river to the sea heading for Enniscrone where it will be the centerpiece of a transport themed glamping village in Enniscrone. Labrador Airways Limited, established and started operations in 1948, as Newfoundland Airways, operating as Air Labrador, was a regional airline based in Goose Bay (CFB Goose Bay), Newfoundland and Labrador, Canada. 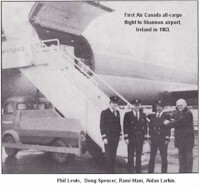 It operated scheduled daily passenger and freight services throughout Labrador and Quebec. 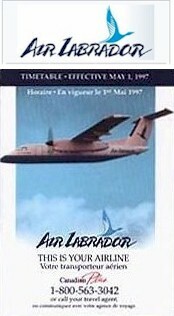 Here is the timetable issued in 1997 for Air Labrador. On February 3, 2012, the company announced that the Nunatsiavut Government bought a 51% share in Air Labrador. 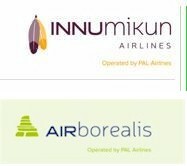 In June 2017 Air Labrador merged with Innu Mikun Airlines to form Air Borealis. Aircraft used by Snowbirds aerobatic team, on the go since 1963, will be kept flying until 2030. The 55-year-old planes used by the Canadian military’s iconic Snowbirds aerobatic team will be kept flying until 2030. Aircraft avionics will be modernized on the CT-114 Tutors to comply with upcoming aviation regulations and the life of the aircraft extended for another 12 years, according to the Royal Canadian Air Force. Effective June 1, flights for our codeshare partner Central Mountain Air (CMA) out of Vancouver International Airport (YVR) will be relocating to the South Terminal (from the Main Terminal), and all CMA flights will depart from and arrive at the South Terminal. Our roots in the aviation industry were planted over 40 years ago in St. John’s, Newfoundland and Labrador. What started as a renowned Atlantic Canadian flight school has grown into one of the largest independent airlines operating in Eastern Canada. Our core services include scheduled flights, air charter and air cargo services. The fleet has two each of Dash-8-300, Dash-8-100, Twin Otter and Beech 1900D. Project Freedom was thought out and built by airplane enthusiast Joe Axline. It includes two separate planes, a MD-80 and a DC-9-41 without their wings, resting next to each other. The MD-80, which Axline named Freedom, provides rooms for friends and family, including a master bedroom, bathroom, and kitchen. The DC-9-41, called Spirit, includes a theater, music room, arts and crafts room, bedrooms, a bathroom, and also a kitchen. Axline has been living in one of the planes from Project Freedom for the last two years. 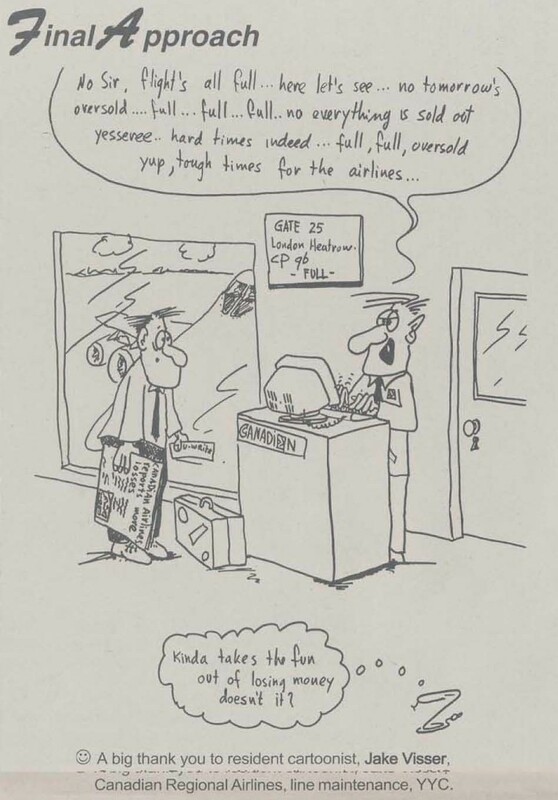 Our cartoon is by Jake Visser, CRA YYC which appeared in the “Canadian Flyer” magazine issued May 1997.